2013 marks the celebration of the United States Soccer Federation’s Centennial. As a footballing nation, we have progressed quite a bit and in the last 20 or so years; we have advanced light years in the art of the beautiful game. In 1989, we finally qualified for our first World Cup in almost half a century, made possible by a 35-yard wonder strike from Paul Caligiuri. In 1994, we hosted the most successful World Cup ever — in terms of attendance — while also shocking tournament favorite Colombia in front of 90,000 plus fans in the Rose Bowl, ensuring we advanced out of group play (this crowning moment of course was not to be overshadowed by the introduction of the greatest jerseys sport has ever seen). The 1994 World Cup also helped spur the eventual formation of Major League Soccer, which as of last year, ranks as the third highest attended sporting league in the United States. In 2002 we opened the World Cup in South Korea by shocking another tournament favorite, Portugal, en route to the quarterfinals (any U.S. Soccer fan knows that we should have beaten Germany in the quarters) of the tournament. Lest I be mistaken if I didn’t also mention that this was the World Cup that also saw us defeat our nemesis to the south, Mexico, behind the firepower of Brian McBride and Landon Donovan, to reach the quarterfinals in the first place. In 2009, during the Confederations Cup, we shocked the reigning European champions, Spain, on our way to our first ever final in a FIFA tournament. It cannot be understated that Spain was in the midst of a 35 match undefeated streak and this is still the only FIFA tournament since before the 2008 Euros that the Spanish have not won. Most recently, in 2010, we won our group at the World Cup for the first time ever and Landon Donovan and co. launched soccer into the collective sports conscious of the American people. This isn’t to say that the last 20 years haven’t come without a great deal of setbacks. The 1998 World Cup brought utter disappointment as the team was dumped out of the tournament having failed to secure a single point; literally finishing last in the World Cup in a tournament the Americans were expected to advance further than we ever had. Entering the 2006 World Cup, following the success just four years earlier in South Korea, the flawed but still followed FIFA world rankings had the United States ranked as high as fourth leading up to the tournament. Once we got to Germany however, we were unceremoniously dumped out of group play with a lone point, albeit coming in a game against eventual World Cup champions Italy. To this day if you ask any American soccer fan about that game, they will tell you we should have walked away with the full three points. This let down led to the firing of perhaps our most successful coach, Bruce Arena, and ushered in the highly debated Bob Bradley era. The 2008 Confederations Cup final provided the United States with our best opportunity ever to win a FIFA tournament. The boys in the Stars and Stripes eventually took a 2-0 lead on Brazil heading into halftime only to surrender the game in the second half and lose 3-2. (Editor’s Note: I watched this game with Rambo as a casual soccer fan and learned to respect soccer so much more after watching this collapse with him. I’ve only seen Rambo that upset one other time in his life and, not surprisingly, it involved the Chicago Cubs.) While winning our group in 2010 under Bob Bradley, we had perhaps the best potential draw to a World Cup semi-final we may ever see only to have our dreams dashed at the hands of Ghana. Finally, in 2011, we were embarrassed in the Rose Bowl by Mexico in the Gold Cup final, ensuring that we won’t be seeing another magical Confederations Cup run in 2013 and ultimately ending Bob Bradley’s stint as manager of our team. These final acts of failure represent missed opportunities and lost chances, but also have taken us to where we stand today. That is with a charismatic German, Jurgen Klinsmann, at the helm of our beloved national team; poised to lead us to Brazil in 2014. Later this afternoon (4 PM EST) Jurgen Klinsmann will lead the Stars and Stripes into the Estadio Olimpico in San Pedro Sula, Honduras to begin the final run up for a ticket to Brazil in 2014. The Hex (for the uninitiated here is the format of the final round of CONCACAF qualifying) begins this afternoon against Honduras and we must find a way to come away with at least a point in this game. With that being said, there are many questions surrounding the state of the USNMT for this game and moving forward towards Brazil. How will the United States handle itself on the road? Winning a game on the road in CONCACAF is never an easy task and with this arguably being the strongest the region has ever been, points on the road are going to be at a premium. The environment in Estadio Olimpico is going to be extremely hostile this afternoon and Honduras has already announced today as a national holiday. We already know San Pedro Sula is the most dangerous city in the world and with an entire day to “get ready” for today’s game, there is no telling how explosive the atmosphere will be. Jurgen Klinsmann’s squad selection for this afternoon’s game reflects a very experienced national team and one he hopes will be able to cope with the pressure. Klinsmann’s selections were primarily foreign-based club players as all of the regulars having been called in: Dempsey, Altidore, Bradley, Bocanegra, Jones, Howard, etc. The lack of experience however comes in a troublesome spot on the field for the United States: The back line. While the German-based full backs, Timmy Chandler and Fabian Johnson have huge upside, they lack playing time with the national team. Geoff Cameron has started almost every game for Stoke City this year, but he still only has 5 caps with the senior USMNT. The center backs also feature the selections of a few MLS youngsters in Matt Besler and Omar Gonzalez. The back-line has not played together often and it will be paramount for them to be able to navigate through a tough environment; unfamiliar to a few of the selections. In addition to the hostile atmosphere the United States is faced with this afternoon, the USMNT will have to deal with the sweltering heat and humidity. Its overall fitness will be tested by this afternoon’s game. Jurgen Klinsmann has always put a premium on fitness and conditioning though and this should not be an issue despite the fact that this team only reconvened Sunday in Miami. How will the back line look? The injury to American stalwart, Steve Cherundolo, is certainly not a good thing for the back line especially playing on the road to open The Hex. However, this could prove a seminal moment for American soccer as this afternoon will see the German-American phenom, Timmy Chandler, finally get cap tied to the senior squad. He will be slotted in to his natural right back position and many expect him to occupy this spot on the national team for years to come. The never-ending quest to find a suitable left back has finally come to an end; or so it seems. Fabian Johnson was a revelation for the USMNT in 2012 and appears poised to become a world-class talent in a position of dire straight for the Yanks. No longer will fans of the USMNT be forced to watch the bane of our angst as players such as Jonathan Bornstein were trotted out at left back. The quest to find a replacement for an aging Captain America, Carlos Bocanegra, is now the biggest question mark of the back line. Geoff Cameron is set to occupy the spot next to Bocanegra in the middle, even though he has been playing mostly on the right side for Stoke City. While Bocanegra provides great leadership, it is unclear moving forward how much he has left in the tank. The upcoming qualifiers will be crucial to see whether the young MLS dynamos of Matt Besler and Omar Gonzalez have what it takes to compete at the international level. Prediction for the game: Look for Carlos Bocanegra and Geoff Cameron to line up in the middle of the defense flanked by Timmy Chandler on the right and Fabian Johnson on the left. Chandler and Johnson are both capable of getting involved in the offensive side of the ball as well. With a lack of any experienced wingers on the current squad width is going to be an issue, so look for both of these players to be making gallivanting runs in open space down either side of the field. It will be important for them to provide some support in attack if we plan on taking any points away from this game. No longer are teams afraid of the USMNT in CONCACAF and at home Honduras may be more inclined to go forward offensively so it will be imperative for Bocanegra to organize our young back line and make sure everyone is in the right spots. What does a midfield without Landon Donovan look like? One of the biggest questions surrounding the United States heading into The Hex revolves around Landon Donovan’s involvement with the USMNT moving forward. 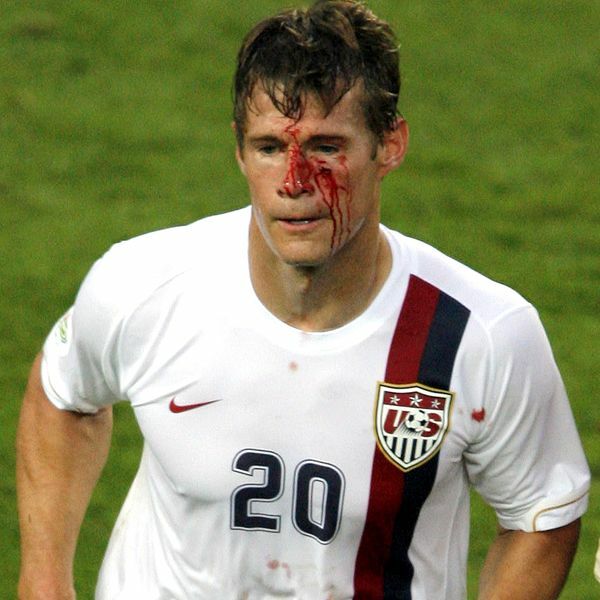 No one is certain whether or not he has played his last game for the Stars and Stripes. As mentioned before, this coupled with the injury to an already out-of-form Brek Shea leave us bereft of any proven wingers. Width is going to be a real issue for the United States. The USMNT has been Landon Donovan’s team for almost the last decade. Now that he is no longer available (at least for the time being) it is finally time to turn the keys to the car over to Clint Dempsey. Whether Dempsey is playing forward or in the midfield, the team will only go so far as Dempsey takes them. While lacking the speed of Donovan, Dempsey certainly has the creativity and a natural inclination for goal. If we are to play with the type of attacking panache that Jurgen Klinsmann desires, Clintu is going to be the player to take us there. Our team has shown it is more than capable of controlling possession against lesser teams, but do we have enough creativity in the final third to actually score? Prediction for the game: With Klinsmann’s squad selection for the game, it looks like we might play a more defensive oriented midfield in this afternoon’s game in an effort to secure at least one very valuable point. I expect the USMNT to line-up with a diamond-shaped midfield. Danny Williams should get the start at the back of the diamond and will be there to provide cover for the back line. Michael Bradley and Jermaine Jones will occupy either side of the diamond and will have to move well off the ball and find space to distribute to our front line. Clint Dempsey can line up almost anywhere on the field, but today expect to see him at the head of the diamond midfield. He should be slotted in right behind our two strikers for the afternoon and have free range of the attacking third of the field. The link up play between the rest of the midfield and Dempsey will go a long way in determining if and how many goals we score. Dempsey can score, but how about our other forwards? If you follow any USMNT players abroad, you know that Jozy Altidore is in absolutely scintillating form for his Dutch team AZ Alkmaar and already has 15 league goals and 20 on the season altogether. Earlier this year he found himself banished, for a brief period from the national team but with his growing maturity as a player and young man he finds himself back in the fold and figures to play a key role in the success of the Yanks. Altidore, coupled with Hercules Gomez, a resurgent Eddie Johnson, a young and talented Terrence Boy and of course Clint Dempsey (whether he plays behind the forwards or alongside them is yet to be determined), the USMNT finally may have found the answer the to their goal scoring woes. Prediction for the game: Dempsey remains the question mark here as stated before. He can line up in the midfield slotted behind the forwards or directly up front with them. For this game at least, I expect Klinsmann to start Jozy Altidore and Hercules Gomez up front together. Gomez is a work horse up front, which is why he is so valuable to us providing a high work rate and a nose for goal while Jozy Altidore should provide much of the holdup play. It should be interesting to see how they work off of each other with and without the ball and whether or not they can be successful in linking up with Dempsey and the rest of the midfield. Of course none of this will matter if they aren’t provided with any quality service. Let’s hope this isn’t the case. I have been a flag bearer for the USMNT both figuratively and literally. After the WCQ at Soldier Field against Honduras in 2009, the stadium’s security had to force us to disperse after the match. I led a group that grew from only about 10 to more than 200 people in singing the national anthem over and over again in the concourse after that win. During last year’s WCQ against Jamaica, I stood proud and waved our flag with 20,000 other screaming fans in Columbus on the anniversary of September 11. Just a few years ago you couldn’t even find soccer on television. Now you can take your pick whether or not you want to get up early Sunday morning and watch a Chelsea match or wait till later in the afternoon to watch the Portland Timbers play the Seattle Sounders at the Clink in front of 45,000 delirious fans. A few years ago I could count on one hand the number of friends I had who could talk soccer. Now everyone wants to discuss MB90’s start to his Roma career (it’s impressive) or Leo Messi’s goal scoring brilliance (we are watching the greatest soccer player ever) with me. I have seen the growth of soccer in the country both on and off the field. The United States of America is a sleeping giant in the world of soccer and we are finally waking up. In the words of the great Clint Dempsey, don’t tread on me. Prediction for the game: 2-1 for the red, white, and blue.